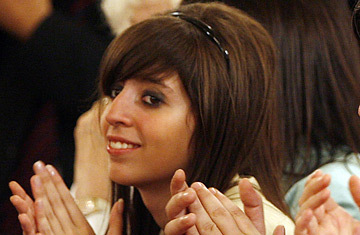 Florencia Kirchner, daughter of Argentine President Cristina Fernandez de Kirchner. Her latest online name is "florkey" and she appears to be your typical online teenage blogger: posting photos of herself and her friends goofing around in short, short skirts or trying to look cool while sipping drinks; she types out the lyrics to her favorite pop hits (at one point, all of Rupert Holmes' "Pina Colada Song") or just puts up pictures of celebrities (for example, Matt LeBlanc from Friends simply captioned "How You Doing?")  all to the amusement and the chagrin of her parents, the current and previous Presidents of Argentina. Seventeen-year-old florkey is Florencia Kirchner, daughter of President Cristina Fernandez and her husband, ex-President Nestor Kirchner. And she's turning heads among cyberspotters and bloggers in Argentina. Dad has reportedly begged his daughter to quit posting pictures on the site (among recent ones: an innocent enough photo from backstage of mom's Dec. 10 inauguration showing herself, her brother and two female cousins, dressed to the nines.) Predictably for a teenager, rather than complying with the parental and ex-presidential exhortation, Florencia simply mutated her alter ego, changing her screen name from "bananarepublic" to "coffeelove" to "florkey." She continues to update her blog obsessively, almost daily. Perhaps it is because Mom has yet to weigh in. "He spoils her more than I do," President Fernandez told TIME last year of her husband's child-rearing policies. "I'm the tough one." The media is both aghast and enchanted. They do not often get a glimpse of life inside Argentina's First Family. Her parents are not particularly fond of the press and do not often give interviews. (Indeed, some members of the Argentine press believe the presidential couple would happily find ways to muzzle the country's hyper-critical newspapers.) Given all that, Florencia decided to interview herself on one of her postings. She identified herself as "Florencia KkKKkk," described herself as "jealous" and "capricious," and expressed admiration for Nelson Mandela. Her favorite country? "Argentina, I think." And her favorite newspaper? "Ha Ha." But more than florkey's comments or outfits, Argentina's First Couple may be concerned by photos of Florencia walking through the streets of Buenos Aires with no presidential security in sight. Part of the Argentine press reacted with alarm when Florencia posted a picture of herself and a friend on Dec. 16, staring into the camera while riding the subway. But others in the media are taking a lighter view: "Florencia Kirchner manages to lead a normal life despite having a President for mother and a former president for father," said Caras magazine. The blogosphere loves her. "Leave her alone, she's just an ordinary teenager trying to enjoy herself," said one recent typical post. Even one of her mother's rivals in the last election gave florkey support  sort of. Opposition candidate Alberto Rodriguez Saa (who in Argentina's convoluted political universe is a member of the same Peronist Party as Florencia's parents) bought ad space on florkey's page to display his election slogan, "Another Country Is Possible." "We take the Internet with a sense of humor," said a spokesman for Rodriguez Saa. It was, however, money unwisely spent; most visitors to florkey's page tend to be too young to vote. "I love you," runs one recent typical comment. "Your mother is an idol, I would have voted for her if I could have." No one brings up the current political headaches of her parents, including an alleged illegal campaign contribution scandal involving $800,000 and Venezuelan President Hugo Chavez. Such worries are happily absent from Florencia's postings, which bring forth adoring exclamations from fans who send best wishes to her "family," call her a "goddess" and beg to be included in her list of "Friends/Favorites." It is likely to be an important constituency. In a few years, they will be old enough to vote for whoever in the family is running for office.